Karl Polanyi started his career as a doctor of law and practiced law for a while; but he did not become a legal scholar. As an economic historian, anthropologist, or sociologist, he was concerned with the relation of economy and society. But even though law is an important factor in mediating this relationship, Polanyi gave little attention to the law as such. As part of an endeavour to advance a ‘Polanyian’ economic sociology of law, this article develops the ‘law of market society’ as an analytical category. For this purpose, three argumentative strategies are combined. First, the article draws on The Great Transformation to reconstruct the role of law in the processes of commodification and decommodification. Second, it turns to Marxist scholarship to explore the conceptual link between law and economics and to ponder to what extent law itself can become a commodity. Third, it links Polanyi’s approach with American institutionalism, and Commons’ work in particular, to show how the evolution of the ‘law of market society’ can also be understood as a collective enterprise which continuously evolves. It is argued that these perspectives complement each other and help to bring the law back in where it is missing. Am Anfang von Karl Polanyis Laufbahn stand ein juristischer Doktortitel, und er arbeitete auch einige Zeit als Jurist, aber aus ihm wurde kein Rechtswissenschaftler. Als Wirtschaftshistoriker, -anthropologe bzw. -soziologe befasste er sich mit dem Verhältnis von Wirtschaft und Gesellschaft. Obwohl das Recht dabei ein bedeutender Vermittlungsfaktor ist, wurde es von Polanyi als solches wenig beachtet. Im Bemühen um eine ‘Polanyi’sche’ Wirtschaftssoziologie des Rechts entwirft dieser Aufsatz das ‘Recht der Marktgesellschaft’ als analytische Kategorie. Dazu werden drei Argumentationsstrategien miteinander verknüpft. Zum einen wird ausgehend von The Great Transformation die Rolle des Rechts im Kommodifizierungs- und Dekommodifizierungsprozess rekonstruiert. Zum anderen wird mithilfe marxistischer Ansätze der konzeptionelle Zusammenhang von Recht und Ökonomik ergründet wie auch die Frage, inwieweit Recht selbst zur Ware werden kann. Drittens wird Polanyis Ansatz mit dem Amerikanischen Institutionalismus, hier insbesondere den Arbeiten von Commons, in Verbindung gebracht, um zu verdeutlichen, dass sich die Evolution des ‘Rechts der Marktgesellschaft’ auch als kollektives Unterfangen verstehen lässt, das sich laufend weiterentwickelt. Diese Perspektiven können einander ergänzen und dabei helfen, dem Recht den nötigen Stellenwert einzuräumen. Karl Polanyi (1886–1964) started as a student of law. When he turned eighteen in 1904, he took one of the options available for members of the educated class and enrolled in the law faculty. In 1909, Polanyi completed his studies as a doctor of law (Múcsi 1990, p. 27), which was a professional rather than scientific degree (Dale 2016, p. 298, note 5). One of his teachers was Gyula Pikler, whose positivist legal philosophy resonated with the socialist student movement, which Polanyi became part of at the time (Múcsi 1979). Pikler’s lessons about the historical contingency and changeability of the law may have had an influence on Polanyi’s legal thinking (Stanfield 1986, p. 4). The hostility that Pikler’s progressive scholarship encountered did have an effect on Polanyi’s intellectual practice: it led to the formation of the Galilei Circle (Múcsi 1990, p. 28), a name suggested by Pikler (Szegedi 2005, p. 441). In contrast, the legal profession as such was of little appeal to Polanyi. In 1910, he started working as a clerk at his uncle’s law office. In 1912, he was admitted to the bar and became a full member of the legal profession. In her “memory of his memories” (Duczynska Polanyi 2006, p. 310), Polanyi’s later wife Ilona recalls that the careers carved out for the three Polanyi brothers in business, law and medicine, respectively, in each case took ironic turns. This is most obvious in Karl’s case, “who was quite unable to tell a fib in the interests of a client” and, instead, “found his true vocation in telling disagreeable truths—at all times and in all circumstances” (ibid., pp. 307–308; original emphasis): as a social scientist and public intellectual. The First World War ended Polanyi’s dismal legal career. 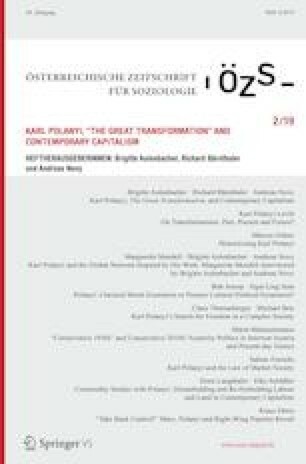 In this article, I will explore a perspective that remained underdeveloped in Polanyi’s work because he was more of an economic historian, anthropologist, and sociologist than a legal scholar: the law of market society (Frerichs 2016).1 This captures the role of law in the commodification process as well as its potential for decommodification. In order to compensate for Polanyi’s limited interest in analysing the law as such, I will relate his work to two congenial approaches in the study of capitalism, which explicitly link law with economics: Marxist scholarship on the one hand and American institutionalism on the other. Since the commonalities with the latter seem less straightforward, a specific contribution of this article will be to establish Polanyi’s affinity with ‘old’ institutional economics, on which the literature is scant (Stanfield 1980; Neale and Mayhew 1983; Neale 1990). Together, these ‘complements’ of Polanyi’s work add important perspectives on the law of market society: of law as a commodity as well as of law as an institution. The backdrop for these two contextualisations of Polanyi’s work, which may help to give a fuller account of the law of market society, can be found in a shared heritage. The writings of Karl Marx and the contributions of the early American institutionalists both have their origins in historical, comparative and holistic scholarship, which was the prevailing approach to the social sciences in nineteenth-century continental Europe. This shared heritage may also explain parallels between the two intellectual traditions in linking law, economy, and society. This can be illustrated as follows. In the nineteenth century, the (German) historical school of jurisprudence, the (German) historical school of economics, and classical historical sociology all formed part of a broader current of scholarship interested in studying societies as organic wholes. Scholars of this generation laid emphasis on the particularities of national collectives and the interdependencies between different social spheres, instead of confining law, economy, and society to separate disciplines. Marx adopted the historical-holistic approach but gave it a critical twist, which was directed against the inherent conservatism of contemporary scholarship. While he polemicized against the historical school of jurisprudence (Marx 1842), which he had become acquainted with early on in his studies (Kelly 2003, p. 11), his intent to complement the critique of political economy with a critique of jurisprudence (Fine 2013) illustrates the link between law and economics as it developed in historical scholarship. The historical school of economics, which drew inspiration from its forerunner in jurisprudence (Pearson 1999, p. 548), flourished in the second half of the nineteenth century but began to fade in the wake of the Methodenstreit (dispute over methods), which took place at the turn of the twentieth century, and the ensuing reorientation of the economic discipline towards greater formalism. However, their substantive approach to the economy not only found resonance in Polanyi’s work (Gemici 2008, p. 20), but also inspired American institutionalism. In the late nineteenth century Germany was a prominent destination for US students to complete their PhDs in political economy, including Edwin R. A. Seligman and Richard T. Ely, who later taught at Columbia University in the City of New York and the University of Wisconsin-Madison, respectively. Upon return to their home country, these German-trained scholars formed a ‘new school’, which was opposed to the classical English tradition of political economy: “Deductive reasoning in economics was held to be suspect: proper procedure called instead for direct empirical investigation of economic reality. Similarly, the notion that economic ‘laws’ could be identified—ones with universal validity throughout time and space—needed to be purged.” (Barber 2008, p. 239) In political terms, the dogma of laissez-faire was replaced with a more favourable view on state intervention (ibid.). These new convictions, which reflect the basic tenets of the German historical school (Cardoso and Psalidopoulos 2015, pp. xv–xvi), laid the ground not only for American institutionalism, but also for the ‘first law and economics movement’ (Hovenkamp 1990). In the twentieth century, Marxist scholarship and American institutionalism came to fulfil similar functions in different scientific and political contexts. Whereas in Europe much critical scholarship on economy and society, including the role of the state and its law, was rooted in the work of Marx (notwithstanding numerous debates and departures from Marxist orthodoxy), this influence was much less significant in American scholarship. As Hodgson put it, “[t]he virtual absence of Marxism in America provided more space for institutionalism” (Hodgson 1994, p. 375). At the same time, the strong presence of the Marxist (and Post-Marxist) tradition in Europe created little demand for imports of institutionalist thought from the US (ibid.). In the following, I will first give an account of the law of market society in Polanyi’s work and link it with Marxist scholarship. Subsequently, I will turn to American institutionalism and its understanding of law in modern capitalism, and again draw links with Polanyi’s work. An often cited passage in The Great Transformation depicts the ‘market society’ as a society in which markets have become a predominant principle of social organisation: “Instead of economy being embedded in social relations, social relations are embedded in the economic system.” (Polanyi 1957b , p. 57) As a system of social provisioning, the economy can be organised in different ways, and markets may only play a subordinate role in the overall setting. In the market economy, markets are ‘unleashed’ from their surroundings, which, according to Polanyi, has tremendous consequences for society: “For once the economic system is organized in separate institutions, based on specific motives and conferring a special status, society must be shaped in such a manner as to allow that system to function according to its own laws.” (ibid.) The ‘law of the market’ comes to affect society as a whole (ibid., p. 71). This turn from the ‘social embeddedness of the economy’, which is considered the historical norm in Polanyi’s substantive approach, to the “embeddedness of economic markets in economics” (Callon 1998), which we find in modern capitalism, involves a shift in the concept of embeddedness from a normative to a cognitive understanding (Frerichs 2011). Accordingly, the proliferation of free markets is, ultimately, an artefact of economic thinking: the “philosophy of economic liberalism” (Polanyi 1957b , p. 269). In The Great Transformation law is occasionally mentioned, but Polanyi does not develop the law of market society as an analytical category. His references to law can be systematised along different stages of economic development. In pre-market societies, markets remain embedded in a complex of “custom and law, magic and religion”, which keeps the gain motive in check (ibid., p. 55). Hence, neither the law nor the market would follow their own logic, as it is often taken for granted today. As to the formation of the market society, the ‘disembedding’ of the market from social relations and its ‘embedding’ in economic thinking are explained by the ‘discovery’ of economics as a science of society, which stipulates new laws of nature: “As gradually the laws governing a market economy were apprehended, these laws were put under the authority of Nature herself.” (ibid., p. 125) This novel way of thinking removes the law of the market from the purview of man-made law, while the policy of laissez-faire still has to be enforced by regulatory means (ibid., p. 139). Law becomes instrumental in the commodification of land, labour and money, with property relations, work relations and debt relations being subjected to market forces. The market-constitutive function of law can be contrasted with its market-constraining function in the context of decommodification, or the ‘re-embedding’ of market exchange through protective legislation. For Polanyi, the latter serves the self-defence of society. Law can thus act both as a commodifier and a decommodifier. Polanyi’s account of the market society owes much to Marx’s critique of political economy, even though Polanyi distances himself from Marx in some respects (Polanyi Levitt 2006, p. 387). Thus, he explicitly distinguishes his concept of ‘fictitious commodities’ from “Marx’s assertion of the fetish character of the value of [genuine] commodities” (Polanyi 1957b , p. 72, note 8). To gain a deeper insight into the law of market society it nonetheless makes sense to link Polanyi back to Marx and explore developments in Marxist legal theory (Frerichs n.d.). Marx’s distinction between economic base and legal and political superstructure is often interpreted in terms of an economic determinism, which makes law appear as an ‘epiphenomenon’. Building on Marx’s work, Evgeny Pashukanis and Isaac Balbus developed a ‘commodity form theory of law’ which goes beyond both the ‘instrumentalist’ assumption that law is determined by the will of the capitalist class, and the ‘formalist’ assumption that law would follow its own, autonomous logic. More precisely, they speak of a ‘homology’ between the commodity form on the one hand and the legal form on the other (Beirne and Sharlet 1980, p. 3; Balbus 1977, p. 577, note 5). Accordingly, basic legal categories are imbued with the logic of market exchange, which is generalised as a form of social organisation. In fact, capitalist society as such could be understood “above all [as] a society of commodity owners”, who mutually agree to exchange commodities on the market (Pashukanis 1980 , p. 75). This is reflected in the institutions of legal personhood, freedom of contract, and private property, which are not simply understood as reflections of the ‘nature’ of human relations, but legal fictions that fulfil a function in capitalist society. Besides organizing the market society, they also serve its legitimation: the formal equality of subjects of rights conceals asymmetries in initial endowments and unequal bargaining power in the market. A deficiency of the commodity form theory is that it first of all applies to private law as it was conceived in classical legal thought. If private contracts are taken as the prototype of legal relations, public law appears but as a “reflection of the form of private law in the sphere of political organization” (Pashukanis 1980 , p. 73). While this applies to the formation of the market society in the nineteenth century, the rise of socially oriented legislation in the twentieth century cannot easily be captured in these terms (Kennedy 2006). The turn to the ‘social’ is a hallmark of legal realism, which sought to overcome the formalism of classical legal thought. It was not only more public-spirited than the latter but also turned to ‘law in action’, that is, to how law works in reality. With Polanyi, we can speak of a countermovement within law and legal discourse, which no longer identifies law with the principle of formal equality, but also considers it as a means to bring about social justice. This obviously fits with the idea of decommodification. However, in the last few decades, the related ‘law and society’ movement seems to have been crowded out by a corresponding ‘law and economics’ movement, which again emphasises law’s economic function. Going beyond both the commodity form theory of law and Polanyi’s account of fictitious commodification, we can claim that, under the influence of economic thinking, law may itself become a commodity, which has a market price, just like the fictitious commodities of land, labour and money. The commodity character of law is most concrete when regulatory competition allows a ‘law market’ to arise, and a certain legal rule or regime can be marketed and shopped for at the national, regional or global level (O’Hara and Ribstein 2009). Academically, it is promoted by the ‘economic analysis of law’ (Posner 1972), which studies the efficiency of legal institutions in a neoclassical or neoinstitutional framework. Inspiration is drawn from the Coase theorem, which suggests that legal institutions do matter in a world of transaction costs. Whereas the more recent movement of law and economics treats law as a production factor among others, the first wave of law and economics shares basics insights with Polanyi’s work and may, therefore, serve as a more legally attuned complement of the latter (Frerichs and James 2018). Leading representatives of what can also be referred to as ‘original’ law and economics are John R. Commons, a student of Ely, and Robert Lee Hale, a student of Seligman. In the following, I will focus on Commons’ work, which offers a “synthetic and synoptic theory of the economic sphere” and stands out in that it is equally concerned with the “legal foundations of capitalism” and the “economic foundations of law and politics” (Samuels and Biddle 1995, pp. 51 and 53; my translation). Commons distinguishes institutional economics from other, more traditional schools of economic thought by its focus on relations, rules, and transactions, instead of individuals, commodities, and exchange (Commons 1990 , p. 73). His notion of institutions is specified as “collective action in control of individual action” (ibid., p. 69), which refers to the role of agreed rules and shared customs in regulating behaviour. These are defined as ‘working rules’, or law in the broadest sense, including official law (private law, public law) as much as the written or unwritten rules of business (shop rules, codes of conduct, business ethics) (Commons 1924, pp. 6 and 147). The focus of Commons’ analysis is on the normative acceptability of certain types of behaviour in a given community or institutional setting, which defines individual rights and duties in the first place (ibid., pp. 138–140). This viewpoint of public interest is ideally represented by (some kind of) judges, who decide about how best to interpret the existing rules in cases of conflict (ibid., p. 242). Like Polanyi, Commons deals with the commodification of land, labour, and money, albeit not in these terms. Instead, he focuses on the change of rules brought about by the ‘rent bargain’ (regarding private ownership of land), the ‘wage bargain’ (regarding the collective organisation of labour), and the ‘credit bargain’ (regarding the negotiability of debt): political compromises achieved in the medium of law. Like Pashukanis, Commons discusses the concepts of private property, contractual freedom, and legal personhood, which can be considered constitutive of capitalism as such. However, he also demonstrates that these concepts assume different meanings in different phases of capitalist development (agricultural, commercial, industrial). In the end, Commons is less concerned with the philosophy of economic liberalism than with the practices of ‘regulated capitalism’ (Commons 1990 , p. 93). Accordingly, the law of market society is created and shaped in an ‘artificial selection process’, which describes the workings of the political economy as a whole (ibid., p. 377). Before taking stock of how these different intellectual traditions—Marxist scholarship on the one hand and American institutionalism on the other—can improve our understanding of the law of market society, it seems worth exploring an important turning point in Polanyi’s career: his move to the United States. Having emigrated to England in 1933, Polanyi was quickly invited to the US for lecture tours. In 1940 he was granted a three-year fellowship at Bennington College in the State of Vermont. It was during this stay that he completed The Great Transformation, central ideas of which had been developed in Europe (Polanyi Levitt 2006) while others seem to converge with “the mid-century critique of economic society” in US scholarship (Immerwahr 2009, p. 446). More to the issue at hand, it has been argued that the change in Polanyi’s intellectual surroundings may have severed his allegiance with Marxist thinking (Block 2003), which, in turn, may have found expression in adopting an explicitly institutionalist framework. But this is not the point I want to make. The purpose of this biographical spotlight is to document Polanyi’s intellectual proximity to American institutionalism without putting one legacy against the other. After returning to England in 1943, Polanyi was appointed visiting professor of economics at Columbia University in 1947 and relocated to the US (and Canada, for his private home). In previous decades, Columbia had been one of the biggest centres of American institutionalism next to the University of Wisconsin (Rutherford 2016, p. 314). Even though American institutionalism had lost influence by the middle of the century, Polanyi’s appointment could still be seen as an effect of institutionalist sympathies (Rutherford 2004, pp. 66–67). It may have helped that Polanyi had begun to make his “institutional method” more explicit at that time (ibid., p. 67). After his retirement in 1953, he still continued as a research leader. For over a decade in his late career, Polanyi thus got immersed in the American context. The ambitions of Polanyi’s institutional approach are reflected in a lecture given at Columbia University in 1950, which is entitled “The Contribution of Institutional Analysis to the Social Sciences”, as well as his later essay on “The Economy as Instituted Process” (Polanyi 1957a). The former includes the following definition: “Institutional analysis stands here as an abbreviation for a more definite approach to the economic aspects of human society in general than formal or scarcity economics could provide. Essentially, it is that variant of institutional economics that represents a shift back from the formal to the more popular substantive meaning of ‘economic’.” (Polanyi 2014b , p. 58; original emphasis). The fact that Polanyi presented his work as a ‘variant of institutional economics’ raises the question of whether there is only a superficial convergence in institutionalist terminology, or whether there is a more fundamental convergence in institutionalist thought. On the one hand, references to American institutionalism are largely absent from Polanyi’s writings (Stanfield 1980, p. 613, note 43), even though there are some notes on Thorstein Veblen (Polanyi 2014a). On the other hand, there are hints that some of the classics of American institutionalism were discussed in the context of the ‘Interdisciplinary Project on Economic Aspects of Institutional Growth’ (1953–1958), which Polanyi led after retiring from teaching, and namely in the project’s ‘Continuation Group’, which still convened in the years after the project had formally ended (Polanyi 1959). This circle included Harry W. Pearson and Walter C. Neale, who were given the tasks to examine the works of Commons and Clarence Ayres, respectively (Neale 1990, p. 150, note 2; Pearson 1959). Neale later refers to Pearson as the one who stirred his deeper interest in reading Commons (Neale 1987, p. 1205, note 30), whose notion of ‘working rules’ was key in developing Neale’s own understanding of institutions (Neale and Mayhew 1983, pp. 11 and 15). From 1958 onwards, Neale held teaching positions at the University of Texas at Austin, one of the remaining centres of institutional economics after neoclassical economics had come to dominate the discipline (Rutherford 2016, p. 325). While he concedes that “as of 1950” one might not have considered Polanyi as one of the “great American institutionalists” (Neale 1990, p. 145), he eventually made a case for elevating Polanyi to their ranks at a faculty evening seminar in 1967 (Adams 1990, p. 327). Twenty years later, Neale published an article on institutions in the Journal of Economic Issues, the flagship of American institutionalism (Neale 1987). This piece contains references to Veblen, Commons, and Ayres, amongst others, while the acknowledgements include “special debts to Karl Polanyi, my mentor in these matters” (ibid., p. 227). Neale’s work thus exemplifies that it is entirely possible to merge Polanyi’s ideas with those of American institutionalists. To conclude my argument, I will briefly demonstrate how an institutional analysis along the lines of Commons’ approach may overcome limits inherent in Polanyi’s original account of commodification. In The Great Transformation, the law of market society is circumscribed by its role in the processes of commodification and decommodification. While the market-constraining function of law is evident in socially oriented legislation, the market-constitutive function of law goes down to fundamental legal concepts, which represent the “dogmatic foundations” of the market (Supiot 2007, p. 94). This yields a dichotomous picture of two types of law with distinctive, or even antagonistic, rationalities, which in principle would counteract each other in one and the same political-economic system. Such a perspective has difficulties grasping the complexities of contemporary forms of capitalism, which are marked by commodification and decommodification at the same time. In ‘welfare capitalism’, social protection does serve an economic function. Commons shared Polanyi’s interest in “the tendency inherent in an industrial civilization to transcend the self-regulating market by consciously subordinating it to a democratic society” (Polanyi 1957b , p. 234). Yet, for him, this was not a harbinger of socialism. Instead, his hope was in “making [capitalism] good” (Commons 1934, p. 143). He was particularly interested in how the increase in collective control and collective action, which began to show in the “new working rules of new associations and unions” (Commons 1924, p. 140), would change the legal framework of the economy. Rather than framing this ‘tendency’ in terms of alternative political-economic systems, he studied it from an open-ended institutional point of view, which allows for more variety within the capitalist setting. This approach seems more productive to understand the institutional flexibility and resilience of contemporary capitalism, including its many intertwinements of economic and social law. 8 Conclusion: Commodity or Institution? This article aimed to show that a Polanyian account of the law of market society can benefit from insights into the relation of law and economics by Marxist scholarship on the one hand and American institutionalism on the other. This yielded two complementary perspectives: of law as a commodity and of law as an institution. At first glance, these may appear as different ideal types of law: Law as a commodity serves private interests, is tagged with a price and available for sale on the law market. Law as an institution is supposed to promote the public interest and embody “collective reasoning” in a community of citizens (Commons 1924, p. 352; emphasis omitted). However, as analytical perspectives, these two may well be combined, and the law of market society can be considered as ‘institutionalised’ and ‘commodified’ at the same time. The concept of law here encompasses legislation (Gesetz) and justice (Recht). Moreover, the notion of the ‘law of market society’ also hints at law’s relation with the quasi-natural laws of the market.